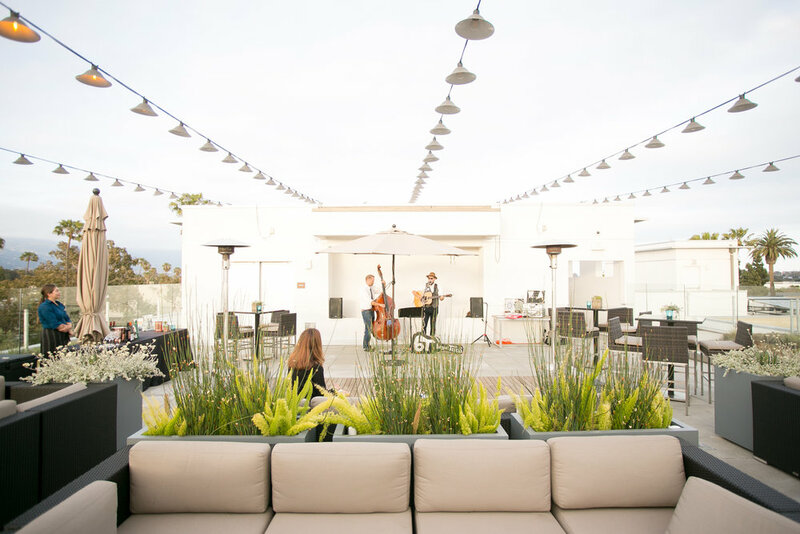 We hosted A-List Wedding professionals to an evening enjoying Sunset, Sips and Savory Bites on "The Rooftop" of Goleta's Hilton Garden Inn. The sun came out on a cloudy day just during our event to create a sensational sunset and help us in our mission of #SharingLoveInSB! The evening's purpose was to showcase scenic views of the rooftop, provide tours of the indoor banquet space as well as rooms of the hotel. The Rooftop offers a no-fuss-no-muss location ideal for hosting welcome gatherings, rehearsal dinners, wedding receptions and post-wedding or a farewell brunches during the wedding weekend. The outdoor location is complete with heaters, string lights, and a Sonos sound system, making it ready-set-go. The new hotel also offers a smaller fire-pit patio on the first floor, for more intimate gatherings, and for hotel guests, a swimming pool as well as modern guest rooms each fitted with microwaves and refrigerators. The banquet team poured some local Santa Barbara wines for guests to wet their whistle. Chef Michael Blackwell prepared savory bites from the banquet menu for us to nibble on, providing us with a taste of his celebrated culinary skills. Garden Street & Company accented the California Casual rooftop setting with succulents. A full-service live decor company, Garden Street will deliver and pick-up their rentable (living) arrangements. No matter how or large or small the event, these freshly made succulent centerpieces come in either white, wooden or modern copper containers. If you have a no-fuss-no-muss event where you want your decor to look great as well as reduce, reuse and recycle your carbon footprint, this is a PERFECT decor option for you! Starting from $25 per rental item, this effortless look is trendy and indicative of the Southern California coastline. Bryan Titus performed their bluegrass and American roots music. The local singer and songwriter, often performing in local Santa Barbara hotspots, has recently been touted as a “Postmodern Barn Dance” band who writes & performs toe-tapping tunes that evoke themes & melodies of yesterday with a pinch of modern irony. If you are looking for a unique vibe for your rehearsal dinner or wedding reception, Bryan Titus is sure to please your guests music needs, and rock the party. Finally, the below images of the cozy rooftop's event and panoramic views are from the talented A-Lister Kelsey Crews Photo. Vibrant, clean and crisp, Kelsey's images capture an authentic edge of photojournalistic skills.